What is the legacy of a great coach? When the players of the Great Falls Central Mustangs arrived for the first day of practice in the fall of 1962, they had their sights set on the unlikely goal of the state championship. But what their coaches delivered was far more lasting than a championship ring; it was life-changing truths that transformed these boys into men, instilling character that would span their lifetime. 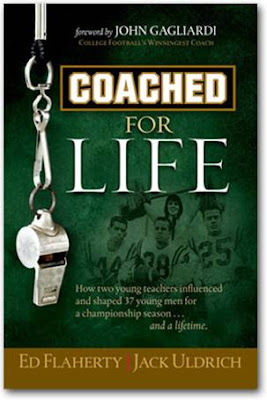 Coached for Life, by Ed Flaherty and Jack Uldrich, is the true account of how two high school football coaches, Bill Mehrens and John McMahon, molded an undistinguished group of young men not only into state champions but also into men with integrity that would follow them the rest of their lives. The book includes a dramatic 40 year retrospect from the players themselves (including Flaherty, a former team captain) describing how the biblical values as well as the hard earned principles of football instilled in them during the 1962 season continued to shape their lives in positive ways long after they left the football field. Great Falls Central High School was a small private Catholic school in Montana, a town made of blue collar working people who held to a strong faith, the same strong current of faith that underscores the lessons of Coached for Life. The authors incorporated the teaching moments from the theology classroom with their teacher, Father Livix, whose forward-thinking, ethical discussions regarding race and equality along with his biblical teaching helped build these men’s character. The 1962 Mustangs went on to distinguish themselves as entrepreneurs, bank presidents, school administrators, multi-million dollar home builders, and even songwriters. Perhaps the greatest testament of the coaches’ lasting influence is the large percentage of players who have followed in their footsteps to become coaches themselves. Each chapter concludes with a summary of the key point and a set of thought-provoking discussion questions, making it the perfect vehicle for corporate leadership studies, ministry volunteer meetings, and teacher professional development. Coached for Life is not just another feel-good football story. Rather, it is an amazing testament to the profound impact that any leader—the coach, the teacher, the boss, the minister, or the parent—can have on someone else’s life, particularly when he or she is leading young people. This book clearly shows that the words and actions of any leader can transform a person, instilling core beliefs that will last a lifetime. With a foreword by the winningest coach in NCAA history, Coached for Life has drawn rave reviews from noted leaders across many fields including the President Emeritus of the University of Notre Dame, the CEO of RE/MAX International, the owner of the Minnesota Timberwolves, and the former governor of Montana. Coached for Life provides much-needed encouragement for weary leaders who sometimes wonder if their hard work really makes a difference.